Volunteers are being offered £14,000 to lie in bed for two months and watch TV to help NASA understand how space travel will affect astronauts. 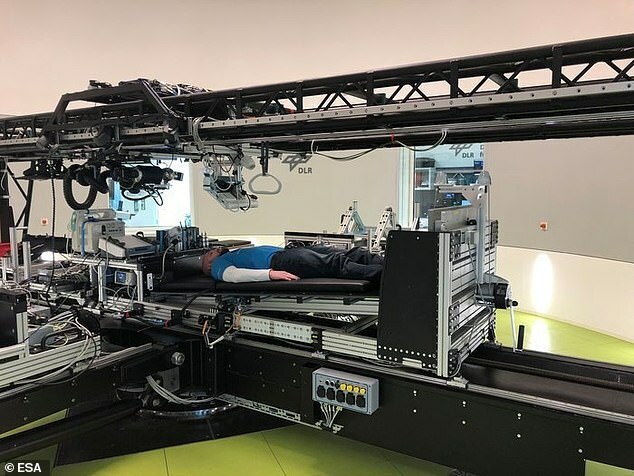 The dream job for many is designed to see how 'artificial gravity' affects the human body and participants will need to do everything lying flat, including going to the toilet. Space experts from both NASA and ESA will study them around the clock in a bid to understand how astronauts may be affected by prolonged spells in space, with muscle wasting the main concern. ESA claim it is integral in understanding the damage that may be caused by weightlessness, cosmic radiation, isolation and spatial restrictions. Two dozen volunteers will be subjected to the 60 days of permanent bed rest in Cologne and all participants must speak German. Only requirements are that participants are between 24 and 55 and healthy. They will be propped up at a slight incline with their feet elevated above their head and body to reduce blood aggregating in the body's extremities. This is expected to mimic the effects of being in space and may result in numbness and muscle wasting. The project from the two space agencies will provide participants with ample entertainment and reading material in exchange for their time. It also recommends the participants use the time and opportunity to enrol in some online courses. Half the participants will undergo treatments akin to that of an 'artificial gravity' chamber. They will be spun around in a centrifuge at 30 revolutions a minute in the hope it will force blood back into their extremities. It is hoped comparing and contrasting the physical deterioration of the two groups - spun and not spun - will provide data to help mitigate this during long-term space travel. A three month time block will need to be cleared in order to take part in the study as a two week period of rehabilitation will follow the test and the 60 day slog is preceded by a five day orientation period.